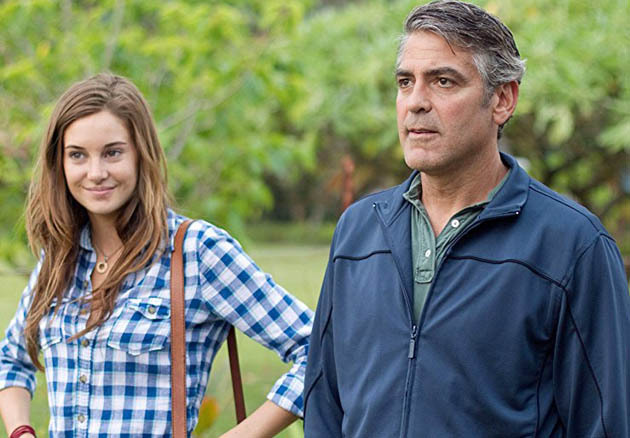 The Descendants with George Clooney and Shailene Woodley. Since the late 1990s, Alexander Payne has been hopping around the United States, making movies about white, presumably heterosexual, middle-aged (or middle-ageish) American men and their problems: Matthew Broderick in the Nebraska-set Election (1999), Jack Nicholson in the Nebraska-set About Schmidt (2002), Paul Giamatti and Thomas Haden Church in the California-set Sideways (2004), and George Clooney in the Hawaii-set The Descendants (2011). The one exception is Payne's very first commercial effort, Citizen Ruth (1996), which focuses on Laura Dern's pregnant drug addict. Alexander Payne's Honolulu-set, family comedy-drama The Descendants, starring George Clooney as a middle-aged attorney at odds with life – things haven't been going very well at all of late – and Shailene Woodley as one of his daughters. Michel Hazanavicius' Hollywood-set French-Belgian co-production The Artist, a black-and-white, silent comedy-drama starring Jean Dujardin as a Douglas Fairbanks-John Gilbert mix whose career heads south at the dawn of the sound era, while former unknown Bérénice Bejo sees her star rise just as rapidly. When it comes to other awards season contenders such as Martin Scorsese's Hugo and Terrence Malick's 2011 Cannes Film Festival winner The Tree of Life, they will likely receive Best Picture Academy Award nominations – the up-to-ten slots surely help – but their chances of actually winning the top Oscar statuette are slim at best. Both Scorsese and Malick have better chances in the Best Director category, which remains, relatively speaking, wide open. Best Actress: Michelle Williams for My Week with Marilyn and Elizabeth Olsen for Martha Marcy May Marlene are the favorites among indie fans. Viola Davis for The Help is the favorite among the mainstream crowd. But then there's Meryl Streep as Margaret Thatcher in The Iron Lady. The SAG Awards should help narrow things down a bit. Best Actor: George Clooney is definitely the favorite choice among U.S. film critics groups for his Honolulu lawyer and family man dealing with a series of unexpected events. Best Supporting Actress: The two main picks have been Octavia Spencer for Tate Taylor's The Help and Jessica Chastain for a variety of movies (including The Help). Best Supporting Actor: Christopher Plummer, who once upon a time romanced both Julie Andrews and Eleanor Parker in the same movie (that's The Sound of Music), is the clear favorite for his work as Ewan McGregor's life- and guy-loving gay father in Mike Mills' Beginners. Not listed above is Yun Jeong-hie, the most unusual – and welcome – Best Actress selection this awards season, courtesy of the Los Angeles Film Critics Association. The veteran actress (Truth, 1975; Divorce, 1979) plays a woman who becomes interested in poetry while beginning to suffer the symptoms of Alzheimer's disease in Lee Chang-dong's South Korean drama Poetry. Screenwriter-director Asghar Farhadi's Iranian drama A Separation has emerged not only as a shoo-in Best Foreign Language Film Oscar nominee but also as the likely winner. Less expected was its Los Angeles Film Critics victory in the Best Screenplay category. Gore Verbinski's Rango, featuring the voices of Johnny Depp and Isla Fisher, is the obvious Best Animated Feature favorite, while The Descendants (Alexander Payne, Nat Faxon, and Jim Rash) has been a consistent Best Screenplay/Best Adapted Screenplay choice. 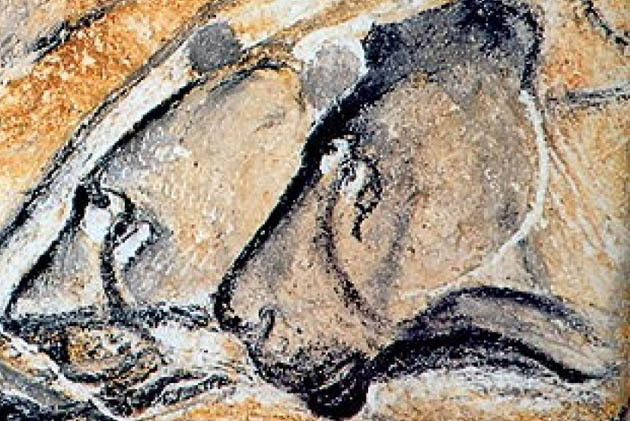 Werner Herzog's 3D effort Cave of Forgotten Dreams – about the artwork found in southern France's Chauvet Cave – has been a top Best Documentary Feature pick. Yet it has no chance of being nominated for an Oscar, as, however puzzlingly, it's not one of the Academy's semifinalists in that category. Located in the Gorges de l'Ardèche, at times referred to as the “French Grand Canyon,” the Chauvet Cave was discovered in 1994. It features some of the oldest known (based on radiocarbon dating) human-made paintings, from about 30,000–35,000 years ago. See below the list of 2011 winners and runners-up/nominees of the Los Angeles Film Critics Association, the Boston Society of Film Critics, the Dallas-Ft. Worth Film Critics Association, the Las Vegas Film Critics Society, the Broadcast Film Critics Association's Critics' Choice Awards, the North Texas Film Critics Association, and the Indiana Film Journalists Association. And further below is a brief commentary about Cahiers du Cinéma's Top Ten movies of 2011. Cave of Forgotten Dreams. Filmed under restrictive conditions after Werner Herzog received permission from France's Ministry of Culture to film inside southeastern France's Chauvet Cave, Cave of Forgotten Dreams seems to be the top Best Documentary choice this awards season. Yet Herzog's 3D effort has no chance at the Academy Awards, as the film, screened at several festivals in 2010 and released in the U.S. earlier this year, is nowhere to be found among the Academy's Best Documentary Feature semifinalists. Runner-up: The Tree of Life. Best Foreign Language Film: City of Life and Death. Best Actress: Yun Jeong-hie, Poetry. Best Actor: Michael Fassbender, Shame, X-Men: First Class, Jane Eyre, A Dangerous Method. Runner-up: Michael Shannon, Take Shelter. Best Supporting Actress: Jessica Chastain, Coriolanus, The Debt, The Help, Take Shelter, Texas Killing Fields, The Tree of Life. Runner-up: Janet McTeer, Albert Nobbs. Runner-up: Patton Oswalt, Young Adult. Best Screenplay: Asghar Farhadi, A Separation. Runner-up: Alexander Payne, Nat Faxon, and Jim Rash, The Descendants. Best Documentary: Cave of Forgotten Dreams. Runner-up: Cao Yu, City of Life and Death. Best Production Design: Dante Ferretti, Hugo. Runner-up: Maria Djurkovic, Tinker Tailor Soldier Spy. Best Score: The Chemical Brothers, Hanna. Best Independent / Experimental Film: Spark of Being. Best Foreign Language Film: Incendies. Best Actor: Brad Pitt, Moneyball. Best Supporting Actress: Melissa McCarthy, Bridesmaids. Best Screenplay: Moneyball, Steven Zaillian, Aaron Sorkin, and Stan Chervin. Best Cinematography: The Tree of Life, Emmanuel Lubezki. Best Film Editing (awarded in memory of Karen Schmeer): The Clock, Christian Marclay. Best New Filmmaker (awarded in memory of David Brudnoy): Sean Durkin, Martha Marcy May Marlene. Best Use of Music in a Film (tie): Drive & The Artist. All Roads Lead to Nowhere: The Films of Monte Hellman (HFA). The Complete Henri-Georges Clouzot (HFA). Science on Screen (Coolidge Corner). Children of Hiroshima (Masterworks by Maneto Shindo, HFA). Days and Nights in the Forest (Sharmila Tagore and Soha Ali Khan: Two Generations in Indian Cinema, HFA). Deep End (The Radical Visions of Jerzy Skolimowski, HFA). The Makioka Sisters (New and Restored Prints, MFA). The Shooting (All Roads Lead to Nowhere: The Films of Monte Hellman, HFA). DocYard co-founder programmers Ben Fowlie, Sara Archambault, and Sean Flynn. Best Director: Alexander Payne, The Descendants. Best Screenplay: Alexander Payne, Nat Faxon and Jim Rash, The Descendants. Russell Smith Award (Best Low-budget or Cutting-Edge Independent Film): We Need to Talk About Kevin. Best Foreign Language Film: 13 Assassins. Best Actor: Jean Dujardin, The Artist. Best Director: Nicholas Winding Refn, Drive. Best Screenplay: Aaron Sorkin & Steve Zaillian, Moneyball. Best Cinematography: Emmanuel Lubezki, Tree of Life. Best Film Editing: Thelma Schoonmaker, Hugo. Best Score: Ludovic Bource, The Artist. Best Costume Design: Mark Bridges, The Artist. Best Art Direction: Gregory S. Hooper, The Artist. Best Visual Effects: Rise of the Planet of the Apes. Best Song: “Man or Muppet” by Bret McKenzie, from The Muppets. Youth in Film: Asa Butterfield, Hugo. Best DVD (Packaging, Design, and Content): Jurassic Park Ultimate Trilogy (Blu-ray). Midnight in Paris, Woody Allen. Moneyball, Steven Zaillian & Aaron Sorkin; Story by Stan Chervin. The Tree of Life, Emmanuel Lubezki; & War Horse, Janusz Kaminski. The Girl with the Dragon Tattoo, Kirk Baxter & Angus Wall. Hugo, Production Designer: Dante Ferretti. Set Decorator: Francesca Lo Schiavo. “Life's a Happy Song,” Performers Jason Segel, Amy Adams & Walter. Written by Bret McKenzie, The Muppets. Thomas Horn, Extremely Loud & Incredibly Close. Best Actress: Viola Davis, The Help. Best Supporting Actress: Octavia Spencer, The Help. Best Director : Martin Scorsese, Hugo. Best Cinematography: Janusz Kaminski, War Horse. Best Animated: The Adventures of Tin Tin. Best Documentary: Being Elmo: A Puppeteer's Journey. Best Foreign Language Film: The Skin I Live In. Best Actress: Elizabeth Olsen, Martha Marcy May Marlene. Best Actor: Paul Giamatti, Win Win. Best Supporting Actress: Viola Davis, The Help. Best Original Screenplay: Win Win. Best Adapted Screenplay: The Descendants. Best Musical Score: Ludovic Bource, The Artist. Original Vision Award: The Tree of Life. The Hoosier Award: Lindsay Goffman, producer of Dumbstruck. Nanni Moretti's We Have a Pope / Habemus Papam was the top movie of 2011 according to the Cahiers du Cinéma editors and film critics. Their Top Ten list is available in the December print edition of the magazine. 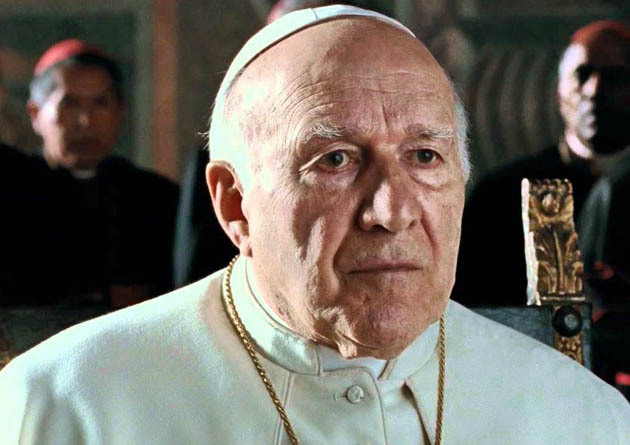 A Vatican-set satire about a newly elected, psychologically fragile pope (Michel Piccoli) and his therapist (director, co-screenwriter, and co-producer Moretti), earlier this year We Have a Pope won six awards from the Italian National Syndicate of Film Journalists, including Best Director and Best Producer (there's no Best Film category). Besides, after losing the Best European Actor award to another troubled power-player, Colin Firth as King George V in The King's Speech, Michel Piccoli was handed an impromptu European Film Academy Lifetime Achievement Award for his six-decade, 180-movie career. Piccoli titles range from Luis Buñuel's Death in the Garden and Jean-Luc Godard's Contempt to Jacques Demy's Une Chambre en Ville and Jacques Rivette's The Duchess of Langeais. We Have a Pope also features Margherita Buy as another psychotherapist. Manoel de Oliveira's Portuguese drama The Strange Case of Angelica / O Estranho Caso de Angélica, about a photographer (Ricardo Trêpa) who, Laura-style, becomes obsessed with the dead daughter (Pilar López de Ayala) of a wealthy hotel owner. Manoel de Oliveira, it should be noted, turned 103 years old on Dec. 11. Terrence Malick's metaphysical/dysfunctional family drama The Tree of Life, starring Brad Pitt, Sean Penn, and Jessica Chastain. The winner of this year's Palme d'Or at Cannes, The Tree of Life has recently earned Malick the Best Director award from the Los Angeles Film Critics Association. Next in line, were Bruno Dumont's Outside Satan / Hors Satan, tied with Jerzy Skolimowski's Essential Killing. The stark, deliberately paced Outside Satan tells the story of how a “miracle” affects the general perception of a loner (David Dewaele) – who may be either god or devil or both – living in a small town in southern France. In Essential Killing, Vincent Gallo plays a former Taliban member who manages to escape from an American-ruled Eastern European prison. Following up in another tie were Lars von Trier's apocalyptic European Film Award winner Melancholia, starring Kirsten Dunst, Charlotte Gainsbourg, and Alexander Skarsgård as three young people facing both a wedding and the end of times, and Philippe Garrel's That Summer/ Un été brûlant, in which Monica Bellucci and Louis Garrel are half of two couples spending the summer in the Italian countryside. Bertrand Bonello's House of Tolerance / L'Apollonide (Souvenirs de la maison close), set in a Parisian bordello at the turn of the 20th century, and featuring That Summer actress Céline Sallette. Kelly Reichardt's subdued Western Meek's Cutoff, with Michelle Williams as a mid-19th-century pioneer traveling across the Oregon High Desert. Shockingly, J.J. Abrams' horror/sci-fi actioner Super 8, with Elle Fanning. What's “shocking” about the inclusion of Super 8 is less its commercial appeal than its pace: just about every other movie on the Cahiers du Cinéma Top Ten list makes a point of taking its sweet time to tell its story (if any). Los Angeles Film Critics Association website. Dallas-Ft. Worth Film Critics Association website. The Descendants image: Merie Wallace / Fox Searchlight. Cave of Forgotten Dreams image: IFC Films / Sundance Selects. We Have a Pope image: Sacher Film / Fandango. “Awards Season: George Clooney Clear Favorite + Pope Movie Satire Tops Cahiers du Cinéma” last updated in July 2018.